One day of freedom from Water Tribe, and I already miss it a bit. Regular day work will help against that. Plus, I still have a page and two panels of offical Avatar comics to do (I'll try to get these done this weekend Dave, sorry about the delay!). I may have mentionned there was a second version of the chapter 4 ending. Here's a quick resume of what it may have been, plus some extra doodles. 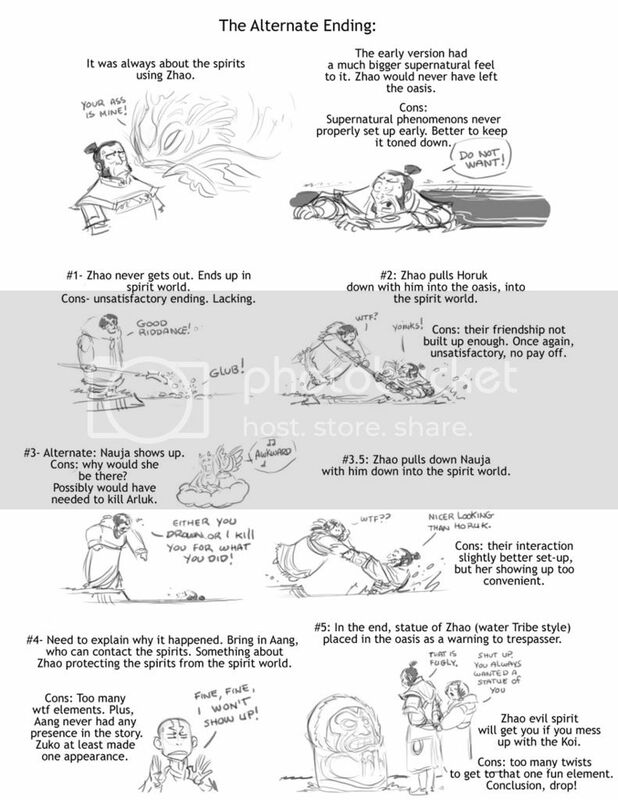 It could've been interesting to try to do some Zhao\Nauja, I...just couldn't make it work properly. I'm terrible at writing fluffy stuff, so I stayed away from it. Or this could be the explanation. And this one just popped in my head this morning. I should use this down time to get a bit of sleep before I'm asked to do overtime. Haha! 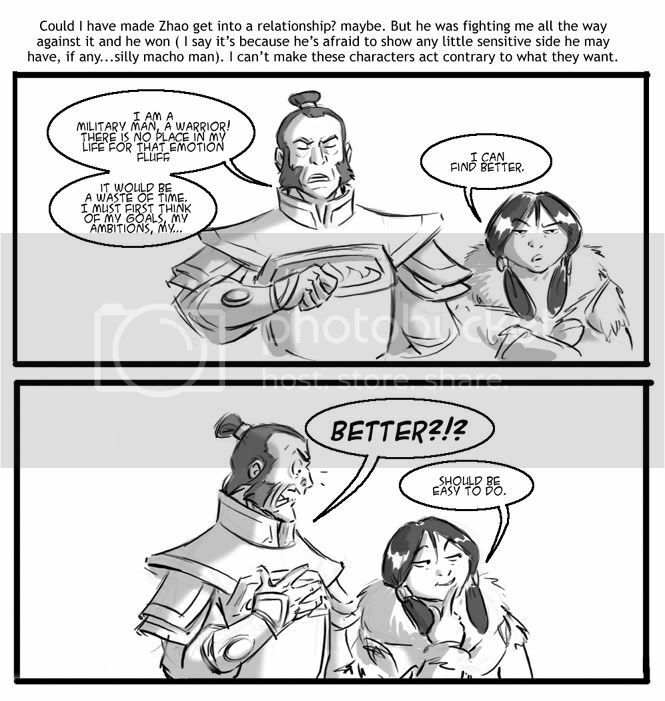 Aang wouldn't have been that odd if he had showed up (like maybe sensing a "disturbance in the forrrrrrce" from wherever he's at), but you made a good choice in keeping him out. I still would have liked to see him all old, though, but Zuko was a total plus. I didn't comment on the last post because I was on my iPod and I hate typing on it! Gah! 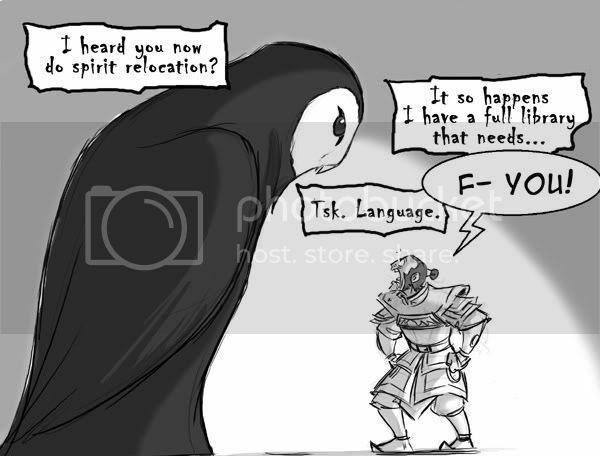 Aang must feel disturbance in the spirit world all the time (when the spirits are not actually physical and making trouble!). But yeah. No Aang. Not here and now anyway. iPod is not a typing tool, so no problems. I am not responsible of any Water Tribe induced high that may cause you to...to...well, whatever high doses of Water Tribe do. Not the type of statue Zhao would have loved of himself, but it's better than nothing. Must admit to have much love for the big bird too. Not the yellow one on Sesame Street. I prefer giant owl of knowledge. He deserves one. Even a fugly one. I like the other endings you thought of, and the reasons they were rejected. I agree with all of them (although that statue is awesome). *snort*- I just had this mental image of Nauja in full scuba gear, stealthily getting aboard the ship and kicking butts in some Mission Impossible type mission. I've been playing too many video games. I'm glad I dropped that original ending. Hey, at least I got to draw the statue once here in the notes. I guess that counts. est ce que tu vas continnuer l'autre AU? Avec vieux Zuko et tout ca? Whenever these moments arise, I'll make sure to post them. I love the bit about Zhao pulling Nauja in the water with her "wtf" face. Always looking for a way to draw little Wan Shi Tong. I love that big owl spirit. Equally awesome depiction of the rejected ideas! In a more doodly kind of way. Especially if the statue was full size! That could freak out anyone. If he dies, at least Nauja'd kinda appreciate him more ^^"
Seconding everyone, love the statue. Wonder what Brian and Mike would think if you show them that statue design. Haha! Too true. She may even find things are kind of quiet and boring now that he's gone (wait, he IS gone!). Bryan and Mike would be throughly creeped out by my fangirlism ("you did how many pages? Get away from us!"). The Zhao statue could use a few more "heads" on top to make it scarier. Awesome totem pole! True- the Northern Water Tribe has some totems. That would be freaky, multiple evil heads Zhao totem. I agree- Piandao would be waaaaaaay better (sorry Zhao). Those mini Zhao statues should sell like hotcakes! Fiiire nation hotcakes, hoo haw! I now have a mental image of a shelf filled wih mini Zhao statues...all on discount at a dollar store. Hey! Tracking layers of blubber takes skill!